This hilarious, heartwarming tale of “America’s best loved family” will crowd the stage with laughter. 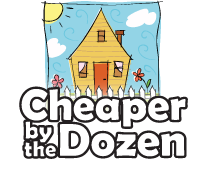 Based on the real life exploits of turn-of the-century efficiency pioneer, Frank Gilbreth, Cheaper by the Dozen chronicles a year in the life of his large and loving family. "What works in the factory will work at home"...makes for a very funny comedy for all ages. KENNETH HARRINGTON (Frank Gilbreth) is very pleased to be making his debut on the Plaza stage. He has been teaching Theatre at North Crowley High School in the Crowley ISD for the past five years. Prior to his position there, Kenneth spent time in Chicago training and performing under Charna Halpern with Improv Olympic and also as a regular performer with the comedy troupe, Lone Star Comedy in Dallas under the direction of Randy Bennett. Kenneth has also been in a number of television commercials and a independent films. He holds his undergraduate degree in Radio, Television and Film from the University of North Texas, and his masters degree in Educational Administration from Lamar University. Kenneth has been married to his wife, Andrea, for 18 years, and together they have two children, Hope and Trevor. And, by jingo, Kenneth hopes you enjoy the show. LUKE HUNT (Frank Gilbreth) is performing in his third PlazaCo production, having previously appeared as Eric Swan in CASH ON DELIVERY and Chris Cringle in BEAU JEST. Luke has also appeared in productions for the Carnegie Players, where he has played Aslan in THE LION, THE WITCH AND THE WARDROBE, Maurice in BEAUTY AND THE BEAST and C.C. Showers in THE DIVINERS, and directed THE MOUSETRAP, A MIDSUMMER NIGHT'S DREAM, and 1776 where he also played Thomas Jefferson. He has a B.A. In Theatre Arts from California State University San Bernardino and teaches theatre at Alvarado Junior High School. He is a co-owner of Gotta Dance Cleburne with his wife, Rachel. Luke is excited to be sharing the Plaza stage with such a talented cast, including his real life daughter and son, Dora and John. TABITHA BARRUS (Anne Gilbreth) is thrilled to be returning to the Gilbreth family after playing Martha in Artisan Center Theatre's production of Cheaper By The Dozen in 2006, and is honored to be onstage with this talented cast. Tabi loves being in shows, and recent favorites include Sarah in SEVEN BRIDES FOR SEVEN BROTHERS, Gloria in THOROUGHLYMODERN MILLY, and Corliss in KISS AND TELL. Tab thinks the best thing about this show is being onstage with her real-life siblings, and she sends lots of love to Parky, Cam, Edie, Mimi, and baby. She also sends a shout out to her fantastic mom and dad, who are thankfully NOT the "strictest parents in town", as well as her extremely stupendous friends for being so doggone wonderful. "Snake Hips!" PARKER BARRUS (Frank Gilbreth, Jr.) has been in a few shows here at Plaza. You may remember him as Raymond in The Washing Machine in CASH ON DELIVERY,KISS AND TELL Fredrich in SOUND OF MUSIC and Collin in THE SECRET GARDEN. He also played Ruby Sideburns in the Lolly-Pup's Roundup show BLACKBEARDS BIRTHDAY BASH. Park is an inventor (better keep an eye on the blue tape) and a professional big brother. He sends loves to Tabby, Cam, Edie and Mimi. GARRETT WHITEHEAD (Frank Gilbreth, Jr., Joe Scales) is thrilled to be in his 5th production here at PlazaCo. Some of his favorite roles include being a Wrangler in WILL ROGERS FOLLIES at PlazaCo, Tobias in SWEENEY TODD at CHS, and Gideon in SEVEN BRIDES FOR SEVEN BROTHERS at PlazaCo. He will be attending Ouachita Baptist University to major in Theater. He would like to thank all of the Plaza producers, Christine, and his family and friends for giving him this wonderful opportunity. DANA SILER (Ernestine Gilbreth) is very excited to be in her first major role ever. Past show experiences are Martha Crachit/Leticia Fezziwig in CHRISTMAS CAROL, Wolf/Townsperson in BEAUTY AND THE BEAST, Mother in VOICES, and Ghost of Christmas Past in A DICKENS CHRISTMAS CAROL. Dana will be in her freshman year this Fall and likes to play tennis and act. "Thanks to my mom and dad for driving me and my brother to rehearsals and my friends at school for being my "Line Buddies ;)"
DORA HUNT (Martha Gilbreth) Dora is 14 and has just finished 9th grade at Alvarado High School. This is her 16th show ever and her 2nd show at Plaza. She appeared on the Plaza stage in THE MUSIC MAN and last appeared onstage in Cleburne in Carnegie's production of THE BEST CHRISTMAS PAGEANT EVER. Favorite roles include Ellen in THIS IS A TEST, Josie Kilbride in BY THE BOG OF CATS, the Red Queen in ALICE IN WONDERLAND, and Calliope in FASHIONISTAS. She'd like to give a shout out to Kristin, Christine, the whole cast, anyone who might read this bio, and the best double in the world for being awesome! BLAKE FREEDMAN (Bill Gilbreth) Blake is very happy to make his Plaza Theatre debut, and be a part of a large and talented cast. Blake is a member of the Drama Select program at Kerr Middle School and has been featured in The Candy Shop Murders,An Evening With Merlin Finch and Fractured Fairy Tales. Blake pursues his comedic aspirations by performing stand up at classmates parties . Blake would like to thank the Staff of Plaza Theatre for giving him the opportunity to perform and experience such a first class production. Also a big thank you to his parents for all their support . JOHN HUNT (Bill Gilbreth) John Hunt just finished 7th grade at Alvarado Junior High, where he played Bilbo Baggins in THE HOBBIT and won the award for best actor at the UIL District 12-3A One Act Play contest for his turn as Robin Goodfellow in THE RUDE MECHANICALS. He is happy that he gets to wear shoes in this production. This is John's first Plaza show but he has appeared on the Carnegie stage in THE LION, THE WITCH AND THE WARDROBE, OLIVER!, and a few others. KATHERINE BALABAN (Lillian Gilbreth) Katherine is thrilled to be making her first acting debut with Plaza Theatre! She is in her seventh year of homeschooling and loves piano, singing, and being with her brothers and sisters. As the seventh of ten children, Katherine brings a certain amount of understanding into the experience of being from a big familly like the Gilbreths (not to mention the noise, the craziness, and the fun!) She is thankful to Plaza for this opportunity, to her family for their support, and to God for making all this possible. CAMERON BARRUS (Fred Gilbreth) is happy to be back performing at PlazaCo. Past performances include Sling shot boy in Seven Brides For Seven Brothers WILL ROGERS FOLLIES As James Rogers BEAUTY AND THE BEAST as Chip, A CHRISTMAS CAROL as Fedrick, and SEUSSICAL THE MUSICAL as a Who. Cameron is having a great time doing this show! RYAN SILER (Fred Gilbreth) Ryan is excited to make his theatre debut on the Plaza Theatre stage. Being the son of co-founding producers Milette and Aaron Siler Ryan is no stranger to Plaza, but this is his first time on stage. Ryan enjoys reading and read 2,600,000 words last year as a fourth grader at Marti Elementary. Ryan also enjoys swimming and playing with his brother and sister. CALEB MIDKIFF (Dan Gilbreth) Caleb is the 10 year old son of Mark and Debra Midkiff. He is happy to get to be in another show with his brothers. His Plaza debut was as Winthrop in THE MUSIC MAN. While sharing that role with his younger brother, David, he also played Billy in THE PROMISE in Glenrose. Another favorite role was Randy in THE CHRISTMAS STORY with The Carnegie Players. He would like to thank his dad for supporting him and his brothers in their many theatrical productions. " Dad, you rock!" NOLAN MORALEZ (Dan Gilbreth) Nolan is a 11 year-old homeschooler from Burleson and attends JCCE Co-op. He is glad to be back performing at Plaza Theater! Nolan enjoys acting, swimming, archery, and playing video games. He has performed as an orphan and bookboy in Carnegie Player's OLIVER!, Barney in Plaza's MUSIC MAN, and Steve in Carnegie Player's BEST X-MAS PAGEANT EVER. Nolan attends The Church @ Burleson where he is a Leader in Training. "Thanks to my Grandpa Helmcamp for getting me involved in acting, and to my parents for all the mileage!" EMMELINE SULLIVAN (Jane Gilbreth) EMMELINE SULLIVAN (Jane) is thrilled to be back with her friends at Plaza Theatre Company. A fourth grader from Waxahachie, she discovered her dream of making the stage her career while attending Plaza Theatre Academy’s 2008 summer camp program. Emme has previously enjoyed playing on the Plaza stage in MUSIC MAN and as the Ghost of Christmas Past in A CHRISTMAS CAROL. Other roles include a Lullaby League Munchkin in WIZARD OF OZ and an Oompa Loompa in WILLY WONKA AND THE CHOCOLATE FACTORY, both performances of Waxahachie High School. But Emme’s favorite role to date is that of the unruly Gladys Herdman in THE BEST CHRISTMAS PAGEANT EVER with Ellis County Children’s Theater. Emme wants to thank Plaza for the best experiences of her life, including Plaza Academy’s Broadway Bound Theater Tour to New York this past February. LAUREN ATWELL (Jane Gilbreth) is so excited to appear in another Plaza production! She was previously seen as the Young Kangaroo in SEUSSICAL, Ghost of Christmas Past in A CHRISTMAS CAROL, and Marta in THE SOUND OF MUSIC. Lauren also played Chip in BEAUTY AND THE BEAST with the Carnegie Players. Lauren is a homeschooler who loves gymnastics, swimming and the visual arts. DAVID MIDKIFF (Jackie Gilbreth) avid is super excited to be on the Plaza stage again. He loved being Winthrop in THE MUSIC MAN and a Who in SEUSSICAL. His very first role was Motle's baby in THE FIDDLER ON THE ROOF with the Carnegie Players. His favorite Carnegie role was Chip in BEAUTY AND THE BEAST. David is the 7 year old youngest child of the 6 Midkiff kids. He is grateful to Jaceson and Tina for choosing him for this part. "Thanks, Hannah, for helping me to be a star. You will always be my first Honeybun." GARRETT ATWELL (Jackie Gilbreth) loves playing (on and off stage) at Plaza! He has previously enjoyed the roles of Young Cosmo in SINGIN' IN THE RAIN and Ignorance in A CHRISTMAS CAROL. Garrett is a homeschooler who loves his toys, eating and his baby sister! EDEN BARRUS (Mary Gilbreth) is happy to be at PlazaCo for this show she has also been seen in SEVEN BRIDES FOR SEVEN BROTHERS As Little Girl Bixby WILL RODGERS FOLLIES As a Dog, SEUSSICAL THE MUSICAL as Cindy Loo Who,THE SOUND OF MUSIC as Gretel, A CHRISTMAS CAROL As Tiny Tim, and THE MUSIC MAN In the Ensemble. In Edens Spare time she likes to Costume Design And Dance. JULIE HALL (Mary Gilbreth) Julie Hall is excited to be in her second Plaza Theater show. Her first experience with Plaza was as a Who child in SEUSSICAL. Julie was last seen as Gladys in Carnegie's THE BEST CHRISTMAS PAGEANT EVER, her favorite role to date. Julie will be a 2nd grader at Gerard Elementary next fall. Julie loves Jesus, her family, friends, Field Street Baptist Church, and being on the stage . . . big or small. Julie's enthusiasm and joy is genuinely contagious. Julie told her parents recently that she might be famous one day! She said, "I might be an actress...OR maybe a kindergarten teacher!" MIMI BARRUS (Gertie Gilbreth) Is Exited to be performing in her forth show. Past shows Include A Flower In ALICE IN WONDER LAND At Cleburne High School A Dog In Will Rodgers Follies At Plaza Theatre Company And Towns Girl In MUSIC MAN At Plaza Theatre Compnany. In Miranda's free time she likes to Play Tag Perfom in Ballett And Sing. Mimi wants To send a Shout Out To Her Friend Morgan Atwell. DEVLIN POLLOCK (Larry) Devlin's happy to be back at Plaza for his eighth production. He's delighted to be working with another wonderful cast, and knows that it's going to be a great show! Devlin's favorite roles have been in HIGH SCHOOL MUSICAL as "The Worm", AIDA as a soldier, and in the ensemble of FOOTLOOSE. Dev is grateful that his parents support him in his acting hobby. He'd like to give a shout out to all his friends in the audience, and ask them to wish him luck...'cause he's gonna need it! JUSTIN OLIVAS (Joe Scales) Justin is excited to be in his second Plaza Theatre Company production and is proud to be part of this company. You may remember him from A CHRISTMAS CAROL back in 2008. Justin will be a Junior in Joshua High School this fall. He hopes to be in many more shows. CHRISTINE ATWELL (Mrs. Brill) is thrilled to be back in a Plaza production! Some of her favorite past roles include Penelope in SEE HOW THEY RUN, Betty Blake in WILL ROGERS FOLLIES, Eliza Doolittle in MY FAIR LADY, and Lily in THE SECRET GARDEN. Her signature show seems to be BEAUTY AND THE BEAST which she has performed three times in the past three years - twice playing Belle. Christine's passion for the theater is exceeded only by her love for her amazing family. As always, she wishes to thank her wonderful husband for his faithful support! And much thanks to JaceSon and Tina, as well, for the opportunity to work with this heartfelt story and terrific cast! G. AARON SILER (Dr. Burtons) Aaron is one of the founding producers at PlazaCo and has been involved in over 25 productions here. Some of his favorite roles at PlazaCo include Horton in SEUSSICAL, Charlie Brown in GOOD MAN...CHARLIE BROWN, Neville in THE SECRET GARDEN, and Norman in CASH ON DELIVERY. Recently Aaron won 3 nominations for sound design and acting in the DFW metroplex theatre awards organization called The Column Awards. Aaron has 3 great kids and loving wife and appreciates all they do for him. JACESON P. BARRUS (Dr. Burtons) JaceSon is thrilled to once again be playing for Cleburne audiences at Plaza Theatre and can’t wait for y’all to see this wonderful and exciting show. JaceSon and his wife Tina have co-directed over 20 productions in northern Texas and make up two of Plaza’s four Producers having been producing live theatre in Cleburne since the fall of 2006. JaceSon has performed in many productions and some of his favorites include Harold Hill in THE MUSIC MAN, Pap Finn in BIG RIVER, and Gaston in BEAUTY AND THE BEAST. He has been married to Tina for 17 years and together they are the proud parents of five wonderful children - Tabitha, Parker, Cameron, Eden Grace and Miranda. In his spare time Jace loves classic movies and studying Civil War trivia.